A combination of better than expected European Bank stress test results on Friday and today’s better than expected US New Home Sales brought risk tolerance back to the markets at the start of this trading week. This meant a broad US Dollar sell off and a rally in EURUSD. 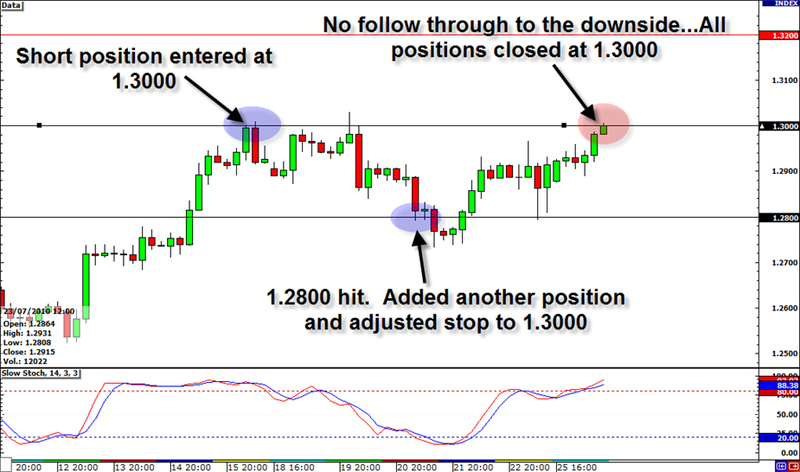 In my last update, I added another position and adjusted my stop on my overall position to 1.3000 to try and take advantage of a possible continued move lower. Unfortunately, the European Bank stress test results came back within expectations of only 5 to 10 banks failing out of the 91 tested–none of which were large banks and of the ones that did fail didn’t require a large amount for recapitalization. Traders took this as a positive, but as I dug in the data I saw the that stress tests did not take into consideration a sovereign default scenario. This was a concern to me, and the main reason why I kept the trade on as I thought maybe the focus will shift to the fact that the test may have not been strenuous enough. I was wrong and the pair didn’t fall any further, and with the US releasing better than expected New Home sales at 330K vs. expectations of 311K, it was all upside for risk taking. My stop at 1.3000 was hit today, leaving me at break even on my initial position and a small loss from my added position. Another small hit to my account and as I look back, what could I have done better? The only thing that comes to mind was that because it is the summer (the markets tend to be range bound), I could have went for the +200 pips I had at one point and banked that. But the stress test was a potential catalyst for a strong move and the large reward-to-risk trade potential I created made holding it worth the risk. It was a tough call and I still feel I made the right one. Other than that, I could have closed the trade down earlier to minimize my losses, but I’m not going to cry over 0.50% loss anyways. Well, with the lack of any major events in the foreseeable future, I will drill down to the lower time frames for short term trades as we continue further into the summer. Thanks for checking out my thoughts, good luck, and good trading to you! Good morning! After testing and holding the 61% Fibonacci retracement level, and the major psychological 1.3000 resistance level, EURUSD has dropped back lower a couple of handles ahead of the European bank stress tests. The pair has made its way to 1.2800 where I have added another half position and adjusted my stop on the total position to 1.3000. This adjustment changes my initial risk of 1% to 0.50% as my initial position entered at 1.3000 is risk free and my new half position at 1.2800 has a risk of 0.50%. This adjustment also increases my potential reward. I will continue to target 1.2000, and with this addition to my position, my max reward goes from a 5% gain to about 7% gain. I will continue to trail my stop and add half of my initial position every 200 pips. Thanks for checking out my blog and stay tuned! After taking a major beating during the European debt crisis in the first half of the year, the euro has rallied back strongly against most of the majors including the Greenback over the past month. As we can see in the chart above, EURUSD bottomed out at the beginning of June before rising to its current levels around 1.2900. Is this a retracement or a new trend higher? First, let us take a look at the current rally and the factors that attributed to it. During this time, the US Dollar began to move in direct correlation with US fundamentals rather than as a proxy of global risk sentiment. Another factor may be a resurgence in the European manufacturing sector, mostly in Germany, due to an improvement in global economic conditions and a drop of the euro in relative value to the other major currencies. Also, this bounce back could be the result of profit taking as the sell off in the Euro may have been a bit too extreme over fears of an EU breakup. 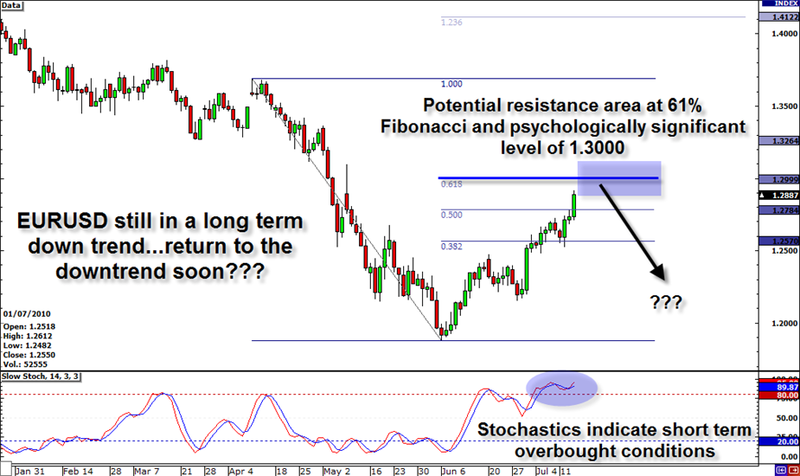 While this has been all good for euro bulls, will these conditions continue? According to recent data, this may not be the case as recent European data in business and manufacturing has slowed down. This makes sense as austerity measures begin to take affect across Europe, slowing even the high flying Germany down. While this reduction in debt and spending has helped the credit ratings and bond sales of some of its member states, this hurts the future outlook of domestic consumption and the employment environment. Also, recently there are signs of weakness in recent US data as retail sales, housing, and unemployment data have disappointed. This has been the reason why we are seeing a weakening US Dollar as of late versus the other major currencies, and probably why we may see further weakness as we continue down the same path as free government money has been taken away this year. So, with a negative outlook on both the US and the Euro zone, why do I favor a return in the downtrend of EURUSD? It’s simple really. While there is a slowdown in both economies, there are still the immediate debt issues in the Euro zone, and because the US still has the deepest and safest markets, it will continue to be the “safe haven” play in times of despair. And I think we may be heading back into a broad global slowdown, especially as emerging markets like China begin to show signs of slowing down. Remember to never risk more than 1% of trading account on any single trade. Adjust position sizes accordingly. If I get triggered, it does go my way, and I am able to add to my position, then this trade should be in the 5:1 to 10:1 reward-to-risk ratio range–say that three times fast! That’s a pretty good payout and definitely worth the risk. Now, there are “X” factors to this trade, most notably the upcoming results and reactions to the Euro bank stress tests. But this is a position trade, so unless we see major movement, my stop size should give me enough breathing room to hopefully be right in the mid-to-long term. Thanks for checking out my blog and stay tuned for updates or adjustments. Good luck!